Published 19th August 2014 by Indigo (Orion). Written in collaboration with critically acclaimed NATIONAL BOOK AWARD finalist Patricia McCormick, Malala tells her story – from her childhood in the Swat Valley to the shooting, her recovery and new life in England. She’s a girl who loves cricket, gossips with her best friends, and, on the day of the shooting, nearly overslept and missed an exam. A girl who saw women suddenly banned from public, schools blown up, the Taliban seize control, and her homeland descend into a state of fear and repression. This is the story of her life, and also of her passionate belief in every child’s right to education, her determination to make that a reality throughout the world, and her hope to inspire others. My Review: I was really eager to read this as soon as I heard about it! I knew very vague details about Malala’s story, and I was keen to learn more about it seeing as I’ve seen a lot of coverage of Malala and her education campaigns, but never properly read about it. This recount of Malala’s life, from she was a child in her home, Swat, right up until her current time in Birmingham, completely blew me away. It really wasn’t what I’d expected and I honestly found it really difficult to stop reading. Malala’s voice captured me from page one; her narration had me entirely engrossed in the story. She and Patricia McCormick (A writer I’ve always wanted to read something from!) are brilliant collaborators: I loved the writing. At a few points I felt like I was reading a fiction book, instead of an autobiographical work. It’s so, so hard imagine that, just before I turned ten, living in the UK, Malala was watching her home village in Pakistan change so terrifyingly with the growing terrorist powers. Malala’s life story made me tear up so much. It’s heartbreaking and shocking – but also there are so many points that made me smile. I loved getting to know Malala in terms of her education rights work – and also getting to know her personally in the book. 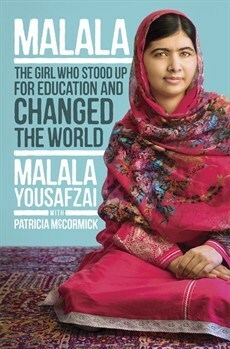 Malala is a great insight into the personal life of someone so inspirational and amazing. Overall, Malala: The Girl who Stood up for Education and Changed the World is a book I’d really recommend to anybody and everybody. It’s such an important read: It’s inspirational, influential and moving – but incredibly informative too, because before I’d seen very little about all of the shocking events that happened in Pakistan. Patricia McCormick and Malala are visibly both incredibly talented writers – and this book will definitely stay with me for a long time. It’s incredibly hard to do this book justice in a review… This definitely isn’t a title you’ll want to miss! I received a copy of Malala from the publisher, in exchange for a review. In no way at all did this affect my thoughts. This entry was posted in Uncategorized and tagged autobiography, life story, malala, malala yousafzai, patricia mccormick, real life, terrorism on September 22, 2014 by keithbwalters. Totally agreed! It’s so crazy and sad to think how I and others never even knew wars were going on. Thank you Rita!